Almost unnoticed, Binyamin Netanyahu won a major victory last week when Barack Obama backed down on a signature policy initiative. This about-face suggests that U.S.-Israel relations are no longer headed for the disaster I have been fearing. 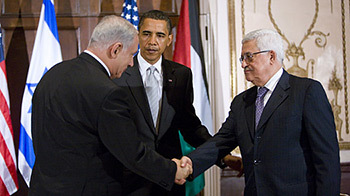 Barack Obama officiates between Binyamin Netanyahu, prime minister of Israel (left) and Mahmoud Abbas, leader of the Palestinian Authority. Four months ago, the new U.S. administration unveiled a policy that suddenly placed great emphasis on stopping the growth in Israeli "settlements." (A term I dislike but use here for brevity's sake.) Surprisingly, American officials wanted to stop not just residential building for Israelis in the West Bank but also in eastern Jerusalem, a territory legally part of Israel for nearly thirty years. Secretary of State Hillary Clinton launched the initiative on May 27, announcing that the president of the United States "wants to see a stop to settlements – not some settlements, not outposts, not natural growth exceptions," adding for good measure, "And we intend to press that point." On June 4, Obama weighed in: "The United States does not accept the legitimacy of continued Israeli settlements. … It is time for these settlements to stop." A day later, he reiterated that "settlements are an impediment to peace." On June 17, Clinton repeated: "We want to see a stop to the settlements." And so on, in a relentless beat. Focusing on settlements had the inadvertent but predictable effect of instantly impeding diplomatic progress. A delighted Mahmoud Abbas of the Palestinian Authority responded to U.S. demands on Israel by sitting back and declaring that "The Americans are the leaders of the world. … I will wait for Israel to freeze settlements." Never mind that Abbas personally had negotiated with six Israeli prime ministers since 1992, each time without an offer to stop building settlements: why should he now demand less than Obama? In Israel, Obama's diktat prompted a massive popular swing away from him and toward Netanyahu. Further, Netanyahu's offer of even temporary limitations on settlement growth in the West Bank prompted a rebellion within his Likud Party, led by the up-and-coming Danny Danon. 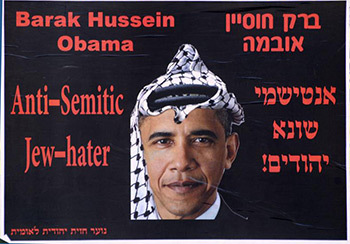 Poster showing Barack Obama in Arab headdress, seen in downtown Jerusalem on June 14, 2009. The geniuses of the Obama administration eventually discerned that this double hardening of positions was dooming their naïve, hubristic plan to settle the Arab-Israeli conflict within two years. The One's reconciliation with reality became public on Sept. 22 at a "summit" he sponsored with Abbas and Netanyahu (really, a glorified photo opportunity). Obama threw in the towel there, boasting that "we have made progress" toward settlement of the Israeli-Palestinian conflict and offering as one indication that Israelis "have discussed important steps to restrain settlement activity." Settlements no longer dominate U.S.-Israel relations but have reverted back to their usual irritating but secondary role. Abbas, who keeps insisting on a settlement freeze as though nothing has changed, suddenly finds himself the odd man out in the triangle. The center-left faction of the Obama administration (which argues for working with Jerusalem), as my colleague Steven J. Rosen notes, has defeated the far-left faction (which wants to squeeze the Jewish state). Ironically, Obama supporters have generally recognized his failure while critics have tended to miss it. A Washington Post editorial referred to the Obama administration's "miscalculations" and Jonathan Freedland, a Guardian columnist, noted that "Obama's friends worry that he has lost face in a region where face matters." In contrast, Obama critics focused on his announcing, just one day after the mock summit, that "America does not accept the legitimacy of continued Israeli settlements" – a formulaic reiteration of long-established policy that in no way undoes the concession on settlements. Some of those I admire most missed the good news: John Bolton, former U.S. ambassador to the United Nations, stated that Obama "put Israel on the chopping block," while critics within the Likud Party accused Netanyahu of having "prematurely celebrated" an American policy shift. Not so. Policy winds can always change, but last week's capitulation to reality has the hallmarks of a lasting course correction. I have repeatedly expressed deep worries about Obama's policy versus Israel, so when good news does occur (and this is the second time of late), it deserves recognition and celebration. Hats off to Bibi – may he have further successes in nudging U.S. policy onto the right track. Next on the agenda: the Middle East's central issue, namely, Iran's nuclear buildup. Mr. Pipes is director of the Middle East Forum and Taube distinguished visiting fellow at the Hoover Institution of Stanford University. Jan. 24, 2010 update: Not only did the focus on "settlements" knock Fatah out of the negotiations, as noted above, but the freeze that Netanyahu did agree to in September 2009 aroused such fury on the right of his ruling coalition that he felt compelled to declare that Israel will permanently keep control over parts of the West Bank.